William West, The Israelites passing through the Wilderness, Preceded by the Pillar of Light (1845), K4234, Bristol City Museum & Art Gallery, Bristol, United Kingdom. The use of this painting does not necessarily mean that the author identifies the Biblical column of light as a form of the axis mundi. Virtually every culture on earth preserved traditions of a stupendous sky-reaching column that mythologists collectively refer to as the axis mundi or ‘world axis’ — a theme that can now be understood with the help of plasma science. Numerous elements in the traditional descriptions of cosmic pillars are entirely meaningless had they been inspired by the earth’s rotational axis, the Milky Way or the ecliptic in their present forms. One such puzzling trait is the widespread belief that the column emitted a dazzling radiance comparable only to the lightning or the sun. 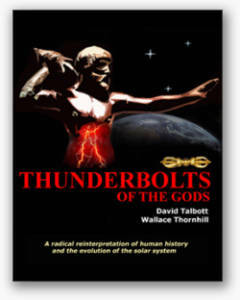 The scintillating quality of the mysterious object ancient myth-makers described as a tree, a rock or a giant ‘man’ rising up to heaven is a strong indication that the original referent was a plasma phenomenon. That the solar system, like the rest of space, is inundated with plasma, mostly in a very rarefied state, has now been well established. Plasmas shift from a ‘dark mode’, invisible to the human eye, to a ‘glow mode’ and then to an ultra-bright ‘arc mode’ under increasing electrical strain. 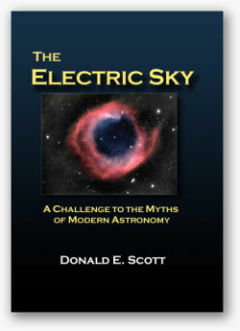 Since lightning as well as the sun consist of visible plasma, it is understandable that prehistoric eye-witnesses of an aurora-like illumination of the earth’s magnetosphere, in their effors to capture the experience in words, would resort to the terminology of lightning or solar irradiation distinct from the quotidian sun. Indeed, the hypothesised plasma tube that once emanated from one or both of the earth’s magnetic poles must at times have emitted synchrotron radiation. Synchrotron radiation is defined as electromagnetic emission generated whenever electrons moving at a speed almost identical to the speed of light come into the presence of a magnetic field or a component thereof that lies at an angle to their path, forcing these so-called relativistic electrons to perform a circular or helical motion around the magnetic field lines. Excepting man-made light using modern technology, any such radiation emitted at visible wavelengths is, under today’s tranquil conditions, derived from extremely remote sources such as the Crab Nebula M1 in the constellation of Taurus and the ‘jet’ coming from the elliptical galaxy M87 in Virgo. 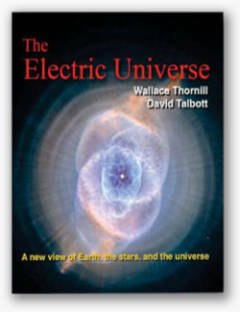 It now appears, however, that the earth’s biosphere was also bombarded with a much closer source of visible synchrotron radiation light during the Neolithic period – light so unbearably bright to the unprotected human eye, and arguably lethal in many cases, that human observers keen on watching or recording the unfolding forms were forced to occupy positions where shields such as rock formations or trees would conceal the brightest sources of synchrotron radiation. From a human perspective, the closest imaginable match for the ineffable intensity of this light is the lightning or the full-blown radiance of an unobtruded sun.